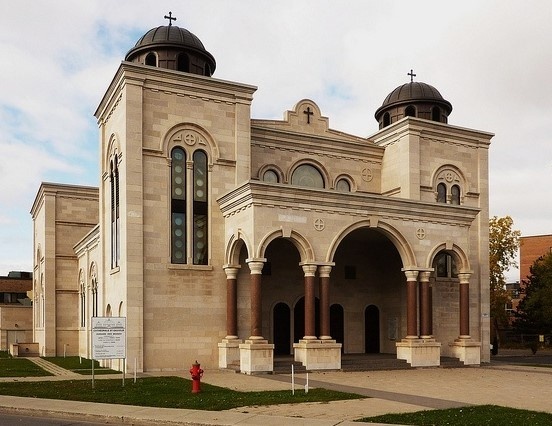 The Greek – Melkite Catholic community includes three “ages”, according to the dates of settlement in Canada: the elders, from the end of the 19th century and the beginning of the 20th century; the group of the years 1950-1960; the last waves from 1975 – 1992, due to the instability of the Middle East in General. The community has some basic characteristics: it is very diverse, including Egyptians, Jordanians, Palestinians, Lebanese and Syrians. It is spread across Canada, from one ocean to the other, with concentration zones, especially in Montreal, Ottawa and Toronto. Francophone and Anglophone are mingled with the life of the country. In 1960, Father Georges Coriaty (Salvatorian Basilian) was appointed Parish priest of Saint - Sauveur in Montreal, which was then a small Parish of thousand souls. Full of zeal, the new Parish priest, impressed by his predecessors, also Salvatorian, watched with more and more collaborators, priests to progress in number and quality of work in the service of the Parish of Saint – Sauveur. When Father Coriaty was appointed by Pope Paul VI as apostolic visitor to all Melkite Catholics in Canada in 1972, he expanded his activity to the Parishes of Toronto, Quebec and Vancouver, while Exarch Habib Kwaiter (also Salvatorian), until his death December 17, 2009, has been working with the same zeal of Ottawa since 1970. Their perseverance was crowned by the creation of the Melkite Greek Catholic Eparchy in Canada. In 1980 the Holy Synod was called by Pope John Paul II to designate a “Terna” for the apostolic exarchate of Canada. Archbishop Michel hakim was appointed by the Pope on October 13, 1980. And on September 1, 1984 the apostolic exarchate of Canada split. On June 30, 1988, Bishop Sleiman Hajjar was appointed second Bishop, succeeding Archbishop Michel Hakim. But on March 10, 2003, Bishop Sleiman Hajjar died suddenly at the age of 52 years. Bishop Michel Sayde was appointed Eparchial administrator until the consecration of Bishop Ibrahim Ibrahim on October 11, 2003. The new Eparchial Cathedral was inaugurated and consecrated on October 28, 2007 by his beatitude Patriarch Gregorios III.